The Skiddaw Hotel is adorned with traditional decorations throughout the entire ground floor of the hotel. 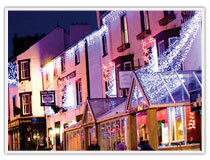 Situated in the centre of the beautiful market town of Keswick, with its wonderful Christmas lights adorning the streets, it is just like a Winter wonderland! Enjoy mulled wine and mince pies, cosy log fires, walks around the lake, plenty of food and lots more entertainment to take you through the Christmas break. To join in the New Year celebrations call 017687 72071.